Is your city trying to take its bike infrastructure to the next level? If so, the Green Lane Project wants to help. An initiative of PeopleForBikes, the bike industry-supported advocacy organization, the Green Lane Project offers technical assistance and other non-monetary support to cities that aspire to add protected bike lanes. In the first round, six cities — Washington, Portland, Austin, Memphis, Chicago, and San Francisco — were selected to help advance their next-generation bike infrastructure. Now, round two of the Green Lane Project is upon us. Program administrators have begun accepting applications from new cities. The competition will likely be fierce. A total of 39 cities have been invited to apply. And any city larger than 80,000 is welcome to throw its hat in the ring as well. The last round saw 42 applications from places as varied as Wichita and Pittsburgh. A new round of six cities will be selected for assistance in 2014 and 2015. 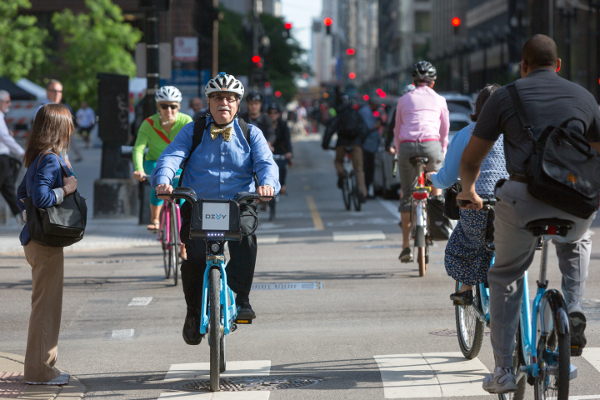 “The winning cities will have a mix of political will, committed staff, and community support to implement ambitious plans for protected bike lanes during the two-year campaign period,” reads the Green Lane Project application. Green Lane Project director Martha Roskowski said this time around, she expects to see a much broader mix of cities. Last round’s scrappy upstart city was Memphis, Tennessee, a city that didn’t have substantial bike infrastructure but did have a highly supportive mayor, city staff, and community. “We’re really interested in finding other cities that are at that place,” said Roskowski. Applications are due in January. Only government agencies are invited to apply.